Shallow fry the goat meat until brown, simmer with the stock cube,water, herbs and salt until soft. ( 1 to 1 1/2 hours depending on the size of the cubes). Cooking times can be reduced in a pressure cooker. Heat some oil in a heavy based pan. Meanwhile blend a the onion, peppers and tomatoes until smooth. Carefully pour the mixture on to the hot oil and fry for 10 th 15 minutes. Stir in the remaining ingredients, turn the heat down and gently simmer for a further 15 minutes. 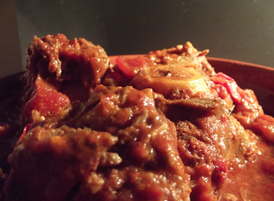 Remove the goat meat from the stock and combine with the sauce. Use extra liquor from the stock if necessary to make a velvety sauce. Serve with steamed or boiled white rice and your favourite chutneys and pickles.